Special Containment Procedures: All instances of SCP-2107 are to be stored in a CNSI1 containment locker at Site 19. Any number of instances may be moved to a refrigerated CNSI unit in advance of experimental trials. Mobile Containment Task Force Theta-61 ("Carbonation-Based Lifeforms") is responsible for coordinating routine screenings for new instances of SCP-2107 at retail venues which are considered probable locations for appearance. Newly discovered instances are to be acquired by conventional methods when possible. For larger quantities or in cases where a retailer's proprietor is deemed likely to become problematic, Acquisition Protocols 0014 ("Covert Theft"), 0015 ("Overt Theft"), and 0047 ("Impersonation of Federal Agency") may be utilized with authorization from staff with security clearance 3/2107 or higher. Individuals exposed to the anomalous properties of SCP-2107 are to be treated with Class A amnestics and remitted to the nearest civilian hospital for any medical care rendered necessary following exposure. Description: SCP-2107 designates a soft drink brand known as "Diet Ghost™" which displays anomalous properties when imbibed.2 SCP-2107 has to date only been encountered packaged by the individual can. Within three to seven minutes of ingestion, subjects (classified SCP-2107-a) begin to experience paranormal activity that most often falls within the colloquial expectations of an individual being haunted by a ghost or other paranormal entity. The effect continues until an as of yet undetermined point in the breakdown of SCP-2107 within the subject's body, approximately one to three hours after ingestion.3 Research has confirmed that the intensity of the haunting effect (herein defined by the quantity of individual paranormal facets, the probability of physical harm, and the severity of said harm) is directly proportional to the quantity of SCP-2107 imbibed. SCP-2107 cans are the traditional variety used for soft drinks, being uniform in design and non-anomalous in composition and behavior. 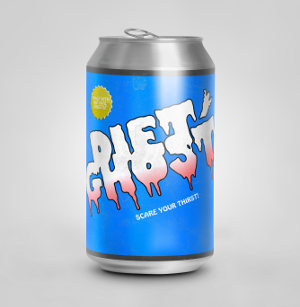 The can features a light blue background with the "DIET GHOST™" logo prominently featured. The catchphrase "SCARE YOUR THIRST!" appears beneath the logo. Most instances also have a sticker on the can with the text "MADE WITH NATURAL GHOSTS!" printed on it; it is unclear if cans lacking this sticker were distributed this way or if the sticker was removed before acquisition. The cans bear no nutritional information. The liquid contents are non-anomalous in chemical composition and within normal parameters for a traditional diet soft drink. Discovery: Initial discovery occurred on 05/13/2012 when seven cans of SCP-2107 were purchased by Foundation personnel at a local supermarket in ██████, ██ during a routine restocking of Site 19's recreational facilities. The partial remains of H██ T████, a Senior Maintenance Assistant at Site 19, were found inside the van requisitioned from Site 19's vehicle pool for the purposes of the trip. Two cans were open and empty of contents when recovered. J██ B███████, the Junior Maintenance Assistant who had been assigned with T████ for the restocking duty, had gone back into the supermarket after having forgotten to procure a copy of the receipt of purchase for Foundation records. According to B███████'s account T████ was alone for no longer than approximately five minutes. A majority of discoveries have occurred in convenience stores, with acquisitions from supermarkets and restaurants accounting for nearly all additional cases.4 Employees of retail locations where instances have been discovered have professed no prior knowledge of the product's existence and records of inventory acquisition have shown no references to SCP-2107. SCP-2107 has now been recovered from retailers in 37 states and 2 Canadian provinces. Production and distribution of SCP-2107 is currently under investigation. + Level 2 Security Clearance Required. Note: Each experiment was carried out using one D-class personnel, isolated in a SHA5 containment cell with closed circuit digital recording. Unless otherwise specified, no individual D-class subject is used for more than one trial. Extraneous, insubstantial, and redundant results have been omitted for brevity; a full version may be found in the SCP-2107 Extended Report. 01 30 mL Duration of trial was 01:12. Subject reported audiovisual phenomena (including "hearing [her] name spoken softly," "shadowy figures" at the edges of her vision, and a "flickering of the lights" within the containment chamber that was not corroborated by the recorded footage. )6 Debriefing revealed the subject to have enjoyed the experience overall. Subject described the taste of SCP-2107 as "bland, but refreshing." 06 90 mL Subject experienced intermittent activity similar to the phenomena in previous experiments for over an hour before new effects presented. At 1:20 the subject began to experience moderate bleeding from the nose without identifiable physical cause; simultaneously, the recording equipment began to encounter interference of a magnetic nature that lasted for two minutes. This is noted as the first instance where activity was observable by non-SCP-2107-a sources in Foundation trials. The bleeding continued unabated for several minutes, causing severe distress to the subject. All effects ceased at 01:28. 07 90 mL Trial begins with activity patterns identical to those described by the subject in Trial 01. Subject's nose began to bleed at the 00:19 mark. At 00:23, subject began emesis due to a combination of distress and nausea caused by the presence of their own blood; this is evaluated to be purely physiological in nature and non-anomalous. Following emesis, a majority of the activity ceased; subject reported still having intermittent hallucinations in his peripheral vision until 00:48. 14 150 mL Subject began to experience phenomena similar to previous trials at 00:02 which rapidly increased in intensity. The lights in the cell are seen to flicker briefly at 00:16 by both the subject and supervising personnel; subject reported the feeling of being lifted off the ground during this effect but this is not visible in the footage. Quantity of activity is approximate to previous trials but level of intensity is significantly higher as reported by subject. Effects began to subside at 00:54 and had ceased entirely at 00:59. Subject observed taste as “average” but expressed difficulty in elaborating upon this description. 31 270 mL Subject experienced no activity until 00:31, at which point all electronics within a 10m radius failed for approximately seventeen seconds. When power returned, subject had fallen to the ground unconscious and the trial was ended. Personnel entered the containment cell and confirmed the subject had expired. Upon autopsy, subject's body was found to be void of most major internal organs; no incision marks or signs of trauma were present. Note: Future experiments are suspended without authorization from staff with security clearance 4/2107. Addendum 12/27/2014: Area ██ personnel have encountered and acquired a previously undiscovered packaging variant. Fifteen cans were produced by a vending machine in Area ██'s cafeteria; when the machine was opened for further inspection no anomalous properties were discovered. These new instances of SCP-2107 feature changes to the design of the background, which now features white silhouettes of tombstones, cats, and cartoonish ghosts interspersed between iterations of the logo. Of note is the addition of new stickers to the can in the same font as the catchphrase text. These stickers include new promotional phrases, including "FROM THE MAKERS OF GHOST™! ", "100% MORE SPOOKY! ", "SCARE-TISFACTION GUARANTEED! ", and "YOUR OLD FAVORITE IS BACK!". All instances of SCP-2107 from Area ██ are en route to Site 19 for containment and research trials to confirm whether their contents produce the same anomalous activity as previously recorded instances. The addition of vending machines to the list of provenance locations is under investigation, with revisions to Object Class and Special Containment Procedures awaiting approval. 2. Animal testing pending approval. 3. Premature depletion of SCP-2107 through unusual means, such as emesis, gastric lavage, or the removal of organs currently containing the fluid from their appropriate bodily systems, causes partial or total cessation of the effect. The death of SCP-2107-a will result in total cessation of all effects caused by their ingestion. 4. Despite the assessment of at least 46 anomalous events suggesting the ingestion of SCP-2107 as the causation factor, markedly few instances have been recovered outside of retail environments. 6. Please see SCP-2107 Interview Logs for unabridged transcripts of post-trial debriefings; Level 3 Security Clearance Required.